Parts required for overclocking LG IPS panels? Monitor Tests Forum > Parts required for overclocking LG IPS panels? I have a Shimian QH270 S-IPS and as you might have figured I want to overclock it and to at least 100Hz. Now I know that Overlord Computers sells those parts but not only that they are too expensive but the customs and taxes would kill me with the added price so I was forced to look elsewhere. ToastyX recommended me Emaxeon, however its owner Josh told me that he is out of stock and wont be getting into this business again. So this leaves only Allbabaexpress and Agretao, the Chinese web sites. The problem is that I am not 100% sure which exact parts are required for overclocking. For example the logical board required for OC is LM270WQ1-SLA1 I found a board that is similar to this one (if not the same) for $10. But since the Chinese didnt do a close up I cant tell is that logic board the one I need. Also I found a LM270WQ1 driver board for $73 which is the one, I 'm pretty sure, required for overclocking. However I have also found this driver board, a newer and universal version for just $42. Are there any differences between the boards? One more thing what is up with boards such as this one is there any difference between it and the LM270WQ1-SLA1 or are they the same? its not that i dont appreciate spending money for the things I like, but I am scared of the customs who can practically double the price anytime they want or even more. I think that this thread would also be useful for any future references. 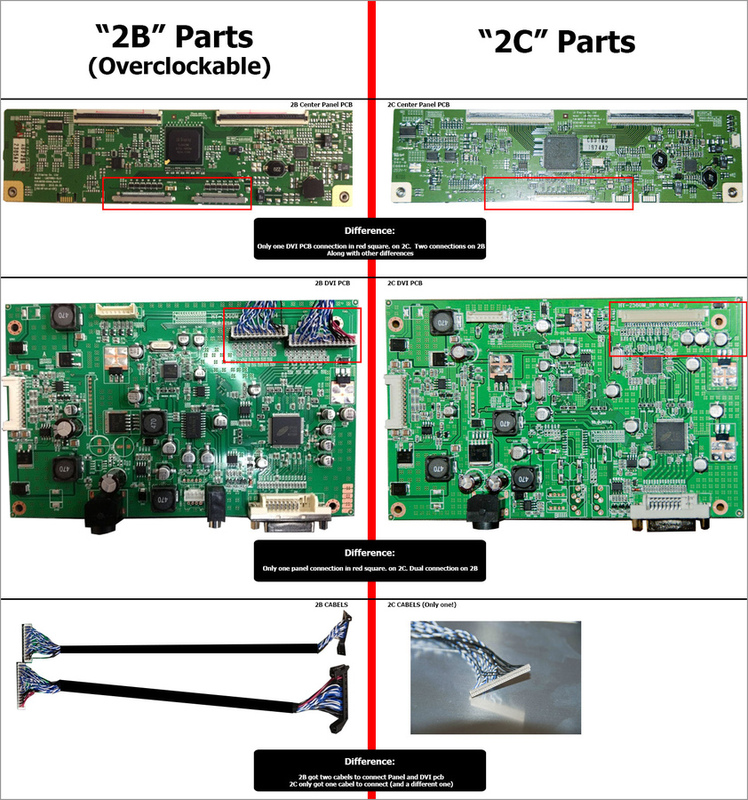 RE: Parts required for overclocking LG IPS panels? (02-20-2015 09:11 PM)Miskonius Wrote: For example the logical board required for OC is LM270WQ1-SLA1 I found a board that is similar to this one (if not the same) for $10. But since the Chinese didnt do a close up I cant tell is that logic board the one I need. You can't use the DisplayPort (DP) version. You need the LVDS version. (02-20-2015 09:11 PM)Miskonius Wrote: Also I found a LM270WQ1 driver board for $73 which is the one, I 'm pretty sure, required for overclocking. That looks like the right one. (02-20-2015 09:11 PM)Miskonius Wrote: However I have also found this driver board, a newer and universal version for just $42. That won't work. That's for the DisplayPort version. (02-20-2015 09:11 PM)Miskonius Wrote: One more thing what is up with boards such as this one is there any difference between it and the LM270WQ1-SLA1 or are they the same? You want the SL version, not SD. The L stands for LVDS, which has the overclockable LG controller, while D stands for DisplayPort, which has the non-overclockable Parade controller. Yup, after reading a few hundred forum pages i managed to deduce that. But that tell me something, are all of these boards at panelook.cn compatible with our monitors and do they provide what we want? Since from what I saw LM270WQ1-SLA1 is not being produced anymore and its, in a way, obsolete. (02-22-2015 02:21 AM)Miskonius Wrote: Yup, after reading a few hundred forum pages i managed to deduce that. As long as the panel is LM270WQ1, the boards are interchangeable, but you need the SL boards to overclock. 1. Can overlclocking (meaning higher refresh rate than specified) damage the panel over time? And are there any potential drawbacks (besides the cold boot problem)? This would be good to know, since if I am already changing PCBs i might as well be ready for another operation in the future. 2. LM270WQ2 PCB is for Dell monitors right? I also saw LM270WQ3's. So these PCBs are not compatible with LM270WQ1 monitors/panels? (02-23-2015 06:27 PM)Miskonius Wrote: 1. Can overlclocking (meaning higher refresh rate than specified) damage the panel over time? And are there any potential drawbacks (besides the cold boot problem)? It might, but there's no hard evidence. My Catleap is still working after 3 years other than the cold boot problem, and I haven't heard many failure reports. (02-23-2015 06:27 PM)Miskonius Wrote: 2. LM270WQ2 PCB is for Dell monitors right? I also saw LM270WQ3's. So these PCBs are not compatible with LM270WQ1 monitors/panels? Thank you Toasty all of you posts have been very helpful. However I came up with two more question, man you can really make FAQ out of this topic. Have you tried G-Sync monitors? And if you did is there any difference between them and our "custom" monitors if they work on 120Hz with constant 120fps? Not in terms of technicalities but in terms of personal experience. I was also following AMD's Freesync to some degree and a thought came to me, is there a PCB that supports VESA standard which will be required for Freesync to work? Or to put it better is there or will it be there a custom part that will enable Freesync for those who have these Korean monitors and AMD cards? (02-25-2015 01:10 PM)Miskonius Wrote: Have you tried G-Sync monitors? And if you did is there any difference between them and our "custom" monitors if they work on 120Hz with constant 120fps? No, I have not tried G-Sync, but a consistent high frame rate is always preferred where possible. 120 FPS at 120 Hz with vsync and backlight strobing would produce the smoothest and clearest motion. G-Sync is more useful when a consistent high frame rate isn't possible. (02-25-2015 01:10 PM)Miskonius Wrote: I was also following AMD's Freesync to some degree and a thought came to me, is there a PCB that supports VESA standard which will be required for Freesync to work? The DisplayPort PCBs might already be capable, but I don't know how to enable FreeSync in the driver. FreeSync also requires one of the newer AMD cards. Of course in order for Freesync to actually work, we need DisplayPort tcons and the ones that are available are with specs from 2009 when 1.0 and 1.1 versions exosted. We need 1.2 version. If you know about some LM270WQ1 tcon that supports 1.2 standard that would be great. One more thing, DP tcons wont overclock from what I gather, right? Running Freesync is not a problem i bought a R9 290 x recently. We also researched (what was within our reach) Asus’s 120Hz 2560×1440 IPS MG279Q FreeSync monitor, which should be released in Q2. The monitor uses AUO panel, and its tcon LSVD interface, the same interface that overclockable LM270WQ1 tcons use which gives us hope that something might be possible. However, Siberx noticed that AUO tcon works on 5V, while LG's work on 12V which might be a problem if we wanna try and run one thing with the parts from the other. Siberx has said that he will try and get that monitor on release, tear it apart and try its parts with his Yamakasi. I thought I had id it all figured out, but now I ma stuck again. Should I buy these tcons that are accessible now or wait for the potential LM270WQ1 tcons that can be overclocked and support eDP 1.2 standard? I doubt the LVDS interfaces between different brand panels are compatible with each other.